Arrange racks in middle and upper third of oven; preheat to 425°. Remove leaves, and trim stem leaving the center root intact. To serve 4, use 2 heads of cauliflower. Place core down on work surface and slice from top to bottom reserving remaining cauliflower for another use. Toss green beans with 1 Tbsp. oil, 1/2 tsp. salt, and 1/4 tsp. pepper on another rimmed baking sheet. Arrange in a single layer, and roast until blister, about 15 minutes. Whisk garlic, lemon zest, 1/3-cup parsley, and 6 Tbl. oil, 1¼ tsp. salt, and ½ tsp. pepper in a medium bowl and transfer half of mixture to another bowl. Add panko and Parmesan to first bowl and mix. Add white beans and tomatoes to second bowl and toss to coat. Whisk mayonnaise and mustard in a small bowl. Remove sheets from oven. Spread mayonnaise mixture over cauliflower. Sprinkle 1/4-cup panko mixture evenly over cauliflower. Add white bean mixture to sheet with green beans and toss. Return sheets to oven and continue roasting until white beans are crisp and panko browns, 5–7 minutes. Top with parsley. Preheat oven to 400ºF. Coat baking sheets with cooking spray. In a large bowl, combine all ingredients. Drop by quarter-cupfuls onto the baking sheets and flatten with a spatula. Bake for 25 minutes. Turn and bake for an additional 10 minutes. Put 1 1/2 tablespoons of the oil in saucepan and heat on medium. Add onion andtumeric. Sauté 5 minutes until tender, add rice and mix. Add water, lemongrass, and salt to taste, and bring to a simmer. Cover and reduce heat. Cook until rice is tender and liquid is absorbed – 15-20 minutes. Remove from heat and let stand for about 10 minutes. Remove and discard the lemongrass. Heat remaining oil and add green onion. Sauté just to heat through, and add to rice mixture. Mix salt, sugar, and 1¼ cups flour until combined. Add butter and mix until it resembles coarse meal with a few pea-size pieces of butter remaining, Add ¼ cup ice water and mix until dough holds together. Squeeze a small amount of dough between your fingers; if it’s very crumbly, add more ice water, 1 Tbsp. at a time (2 Tbsp. max). Do not over-process. Turn dough onto a lightly floured surface and form a rough ball. Knead a few times and roll into a ball. Flatten ball into a disc with smooth edges, cover and chill 1 hour. Line a rimmed baking sheet with several layers of paper towels. Arrange tomato slices on prepared sheet, sprinkle with 1/4 tsp. salt, and cover with more paper towels. Let drain at least 30 minutes. Position rack in bottom rung of oven and preheat to 350°F. After dough is chilled, lightly flour work surface and roll out dough to a 13″ round. Roll dough loosely around rolling pin and release into pie pan. Trim edges to leave a 1″ overhang and crimp as desired. Freeze dough at least 15 minutes. Line crust with parchment paper or foil and fill bottom with baking beans or weights. Bake crust, rotating halfway through, 20 minutes. Remove weights, pierce bottom of crust all over with a fork, and bake again until very light brown and dry, about 10 minutes more. Heat a skillet and add onion, butter, and ¼ tsp. salt, stirring occasionally, until onion is softened and browned. Let cool. 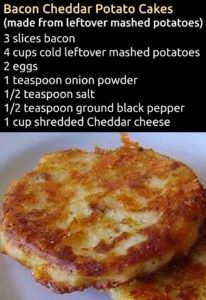 Combine cheese, mayonnaise, herbs, hot sauce, pepper, onion mixture, and remaining ¼ tsp. salt in a medium bowl. Blot tomatoes to remove remaining moisture. 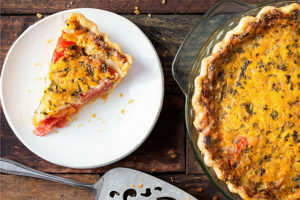 Arrange slices in pie shell and top with filling; smooth. Bake pie, rotating halfway through, until golden brown, 40–45 minutes. Let cool to room temperature before slicing. Blend remaining 3/4 cup basil and remaining 1/3 cup oil in a blender until smooth; season basil oil with kosher salt and black pepper. Arrange bell peppers on a platter. Top with tomatoes, ricotta, olives, and more basil, then drizzle with basil oil and season with sea salt and black pepper. Celery is a vegetable that we often eat raw as well as cooked and it has so many wonderful benefits for us. It is a strongly alkaline food that helps to counteract acidosis, purifies the bloodstream, aids in digestion, prevents migraines, relaxes the nerves, reduces blood pressure, and clears up skin problems. Celery contains compounds called coumarins that are known to enhance the activity of certain white blood cells and support the vascular system. Celery’s rich organic sodium content has the ability to dislodge calcium deposits from the joints and holds them in solution until they can be eliminated safely from the kidneys. 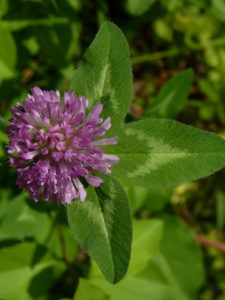 It is a natural diuretic and has the ability to flush toxins out of the body. Celery also has significant anti-inflammatory properties making it an essential food for those who suffer from autoimmune illnesses. It contains significant amounts of calcium and silicon that can aid in the repair of damaged ligaments and bones. Celery is rich in vitamin A, magnesium, and iron which all help to nourish the blood and aid those suffering from rheumatism, high blood pressure, arthritis, and anemia. Fresh celery juice is one of the most powerful and healing juices one can drink. 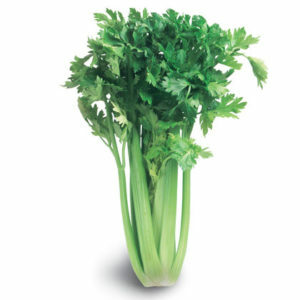 Just 16 oz of fresh celery juice a day can transform your health and digestion in as little as one week. Beets contain important natural antioxidants and are rich in betaine, which stimulates liver cell function enabling the body to eliminate toxins properly. You turn it into a superfood with pickling. To reap the benefits, pickling needs to be done naturally – meaning no vinegar. Water and salt will do the trick. This produces lacto-fermentation. Lacto-fermented foods are vegetables placed in a brine of salt and water for a period of time at room temperature in order to let beneficial bacteria develop. You can ferment any vegetable and it will yield high amounts of probiotics, mostly Lactobacilli that creates lactic acid. Lactic acid protects fermented food from being invaded by pathogenic bacteria. The live organisms are naturally acid resistant and are able to repopulate beneficial organisms in your gut. Lacto-fermented vegetables are more easily assimilated. As well as creating a naturally occurring probiotic supplement, fermentation adds other nutritional benefits. Lactic acid keeps vegetables and fruits in a state of perfect preservation and promotes the growth of healthy flora in the intestine. Fermented foods are the most potent source of beneficial bacteria capable of cleaning your body of toxins and heavy metals. Wash and dry the beets. Poke the beets in several places, place on a baking sheet and bake at 300 degrees for about 3 hours or until soft. Peel off the skin and chop into julienne type slices. Pack beets firmly into a wide-mouth quart-sized canning jar. Make a brine of sea salt dissolved in water. Pour brine over the beets until the liquid is 1 1/2 inches from the top of the jar. Beets need to be submerged in brine. A simple recipe to make traditional, lacto-fermented, homemade sauerkraut using only cabbage, salt and time. Toss cabbage and salt together in a large mixing bowl and squeeze the cabbage and salt together with your hands to break up the cellular structure of the shredded cabbage. When cabbage is limp and releases its juice, transfer it to a sauerkraut crock. Pack the salted cabbage into the crock tightly, eliminating air bubbles, until the cabbage is submerged by liquid. Cover loosely and allow it to sit at room temperature, undisturbed, for at least a month and up to 6 months, testing the sauerkraut every few days until it is done to your liking. Transfer to the refrigerator where it should keep for 6 months and up to 1 year. If scum appears floating in the brine of sauerkraut, spoon it off. The key to preparing any fermented food is that the solid materials rest below the liquid. Fermentation is an anaerobic process and to expose your ferments to air increases the likelihood of contamination by microbes, yeasts and molds. Preheat oven to 375F and oil baking. Pull outer leaf off cabbage, cut cabbage from top to bottom (bottom being root) into 1″ thick slices. Rub both sides of cabbage with smashed garlic. Use a pastry brush to evenly spread the olive oil over both sides of the cabbage slices. Sprinkle each side with a bit of kosher salt and freshly cracked black pepper. Roast on the middle rack for 25 minutes. Carefully flip the cabbage steaks and roast for an additional 25 minutes until edges are brown and crispy. A very nice optional condiment would be adding balsamic vinegar on the top when finished cooking. The Benefits of Sauerkraut Sauerkraut is a probiotic food. The lactic acid process that preserves sauerkraut is ripe with probiotic power. You will find is a product brimming with healthy probiotics that will help ensure good gut health. Because of antibiotic use, and even the chlorine in our water, the healthy bacteria in our systems are often beaten down. Including naturally fermented foods such as sauerkraut is an excellent way to rebuild healthy gut bacteria levels. Sauerkraut has cancer-fighting properties Most of us know that broccoli, cabbage and cauliflower are excellent foods for helping prevent cancer. A Finnish study found that beyond the normal benefits of cabbage, sauerkraut has even more cancer-fighting powers. It was found that through the fermentation process, isothiocyanates were produced that prohibit the growth of cancer. 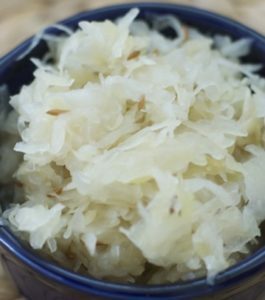 Glucosinolates in sauerkraut were found to help activate the body’s natural antioxidant enzymes, and the flavonoids in it are help protect artery walls from oxidative damage. The study concluded that sauerkraut is an even better choice than raw cabbage for cancer-fighting properties. Cabbage is an excellent source of vitamin U, which can help heal peptic ulcers. Raw cabbage juice is an effective treatment for peptic ulcers. Preheat oven to 400°. Lightly grease a small baking sheet and set aside. Trim the cauliflower to remove green leaves and woody stem. In a medium bowl, combine the yogurt with the lime zest and juice, chili powder, cumin, garlic powder, curry powder, salt and pepper. Dunk the cauliflower into the bowl and use a brush or your hands to smear the marinade evenly over its surface. 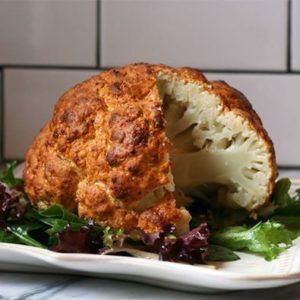 Place the cauliflower on the prepared baking sheet and roast until the surface is dry and lightly browned, 30 to 40 minutes. The marinade will make a crust on the surface of the cauliflower. Let cool for 10 minutes before cutting into wedges and serving. Preheat oven to 350°F. Butter a 9-inch baking dish. Peel and seed squash and slice thinly. Layer squash in baking dish, sprinkling some salt and pepper between each layer. When dish is half filled, sprinkle 1/2 of cheese and thyme over squash. Continue layering with salt and pepper. Pour cream evenly over top layer and sprinkle with remaining cheese and thyme. Cover baking dish with foil and bake until tender, about 45 minutes. Remove foil from baking dish and broil gratin until top is browned about 4 minutes. Preheat oven (or grill) to 425 degrees. Mix the olive oil, bacon bits, lemon juice, worstershire sauce, salt and pepper to make the marinade. Rinse cabbage under water, remove loose leaves, and cut the head in half on the core. Cut the halves in half again to make quarters. Lay each wedge on a sheet of aluminum foil large enough to wrap it up in. Spoon about 2 tbsp of the marinade on top and wrap each wedge and bake for 20-30 minutes. Prepare dipping sauce by combining all of the ingredients in a small bowl. Keep sauce covered in refrigerator until needed. Beat egg and combine with the milk in a medium bowl big enough to hold the onion. In a separate bowl, combine the flour, salt, peppers, oregano, thyme, and cumin. Slice ¾ inch to 1 inch off the top and bottom of onion. Remove papery skin. Cut a 1-inch diameter core out of the middle of the onion. Slice the onion several times down the center creating the “petals” of the onion. Slice through the center of the onion about three-fourths of the way down. Turn onion 90 degrees and slice again in an “x” across the first slice. Slice the sections in half carefully until you’ve cut the onion 16 times. Do not cut to the bottom. Spread the “petals” of the onion apart. Onion sections tend to stick together, so you’ll want to separate them to make coating easier. Dip onion in milk mixture, and coat it liberally with the dry ingredients. Again separate the “petals” and sprinkle the dry coating between them. Once you’re sure the onion is coated, dip it back into the wet mixture and into the dry coating again. Double dipping makes sure you have a well- coated onion because some coating tends to wash off when you fry. Let the onion rest in the refrigerator for 15 minutes while you get the oil ready. Heat oil in a deep fryer or deep pot to 350 degrees. Use enough oil to cover the onion when it fries. Fry the onion right side up in the oil for 10 minutes or until brown. Remove it from the oil and drain on a rack or paper towels. Open the onion wider from the center so that you can put a small dish of the dipping sauce in the center. In a bowl, beat together the eggs, water, paprika, garlic powder, and mustard. In another bowl mix the cornflakes, parmesan or corn starch, garlic powder, paprika, oregano, cayenne, salt, and pepper and set aside. Cut about 1/2 inch off the top of the onion and peel the skin off. Cut the tip of the root off so the onion can stand on it. Cut the onion into about eight wedges being very careful not to cut all the way through. Dip onion in egg mixture, spooning it between each “petal”. Once completely coated toss it in the crumbs, once again spooning it between each petal. Repeat this process, coating the onion once more in the egg mixture and then a final time again in the crumbs (use every bit of the crumbs you can). Place on a greased baking sheet. Drizzle with melted butter and/or oil. Then you can give it a final spritz of cooking spray to make sure the whole thing is coated. Bake at 425ºF for about 45 minutes. Serve with Remoulade Sauce. Mix all together. Keep refrigerated. Serve with seafood, sandwiches, burgers, chicken, fries, onion rings, and Bloomin’ Onions. Mix Parmesan and lemon zest in a bowl. Oil a sheet pan and set aside. Place phyllo on counter and lightly rub each sheet with oil and sprinkle half of each with 2 tablespoons of cheese mixture. Fold each sheet in half and cut into eight 4-inch-wide pieces. Place an asparagus spear diagonally across a piece of phyllo and roll to wrap asparagus. Place wrapped asparagus seam-side down on the prepared sheet pan. You can tightly wrap the pan and chill for up to 24 hours before baking. Bake at 400 degrees until crisp and golden, about 20 minutes. Makes 16 asparagus spears. Mince garlic in a food processor. Add yolk, lemon juice, salt and cayenne and puree. Gradually drizzle in oil while machine is running. Add mint and pulse to mix. Makes ½ cup mint aioli. If you prefer, mince garlic and mint and mix with 1/2 cup prepared high-quality mayonnaise. Preheat oven to 400ºF. Coat two baking sheets with cooking spray. In a large bowl, combine all ingredients. Drop by quarter-cupfuls onto the baking sheets and flatten with a spatula. Bake for 25 minutes. Turn and bake for an additional 10 minutes. Place the potatoes in pot and fill with cold water to cover. Add 1 teaspoon salt and bring to a boil. Cook potatoes until just tender, about 20 minutes. Drain. When cooled, use your palm to carefully smash the spuds just enough to break the skin and flatten the potatoes. Heat oil in a large cast-iron skillet over medium heat. Add the potatoes in a single layer, along with the garlic and rosemary. Cook until the potatoes are browned and crispy on both sides. Add cheese last, to melts on top. Season with salt and pepper. Remove stems and midribs from collards and chop into 1-inch pieces. Rinse chopped collards in cool water and drain. Add oil to a large skillet and warm over medium heat. Add the onion, garlic, and ginger and cook over medium-low heat about 5 minutes until translucent and golden. Add the collards and cook, stirring occasionally, until tender, about 15 minutes. Add up to ½ cup water, if necessary. When collards are tender, pour off excess liquid and cook until the pan is almost dry. Stir in salt and pepper to taste, allspice or hot pepper sauce and vinegar or lemon juice. Sometimes I will add only a few spoons of hot pepper for seasoning. This is quick and delicious! Preheat the oven to 325 F. Trim off the top of each tomato and discard. Remove seeds and most of the flesh leaving a shell. Lightly salt the inside of the tomatoes and place upside down in a colander, to drain off some moisture. Put the onion, garlic, olives, and 1 tablespoon of the oil in a medium pan and cook on low heat for 5 to 6 minutes, to soften the onion completely. Remove from the heat and stir in the panko, herbs, capers, and some pepper. Taste and add salt. Wipe the insides of the tomatoes with a paper towel, then fill them up with herb stuffing, pressing down gently to get a nice dome of stuffing on top. Place the tomatoes in a greased ovenproof dish and drizzle lightly with the remaining oil. Bake for 35 to 45 minutes until the tomatoes soften. Cut off a half-inch slice from the stem end of each tomato. Remove any remaining core. Season cut ends of each tomato with ¼ teaspoon salt. Place cut end down on a rack or paper towel and let drain for 30 minutes. Blot dry with a paper towel. Preheat oven broiler. Line a broiler pan with foil. Place tomatoes cut side up on the prepared pan. Season with pepper to taste and sprinkle 1 tablespoon of fresh herbs over the top of each tomato. Drizzle each tomato with 1 teaspoon of olive oil. Broil until hot, and the tops begin to brown, 5 minutes. Combine the breadcrumbs and cheese and divide evenly among the tomatoes. Broil until the cheese is melted, about a minute. Cut the roots off and rinse the greens under running water. Cut the bigger leaves in half and put them into a pot with salted boiling water for about 10 minutes. Heat 2 tablespoons of olive oil in a skillet and sauté half a chopped onion and one sliced garlic clove until soft. Drain and rinse the greens and add them to the onion and garlic in the skillet till nice and hot. Salt and pepper to taste. Dandelion greens are a great source of dietary fiber, vitamin A, C, E, K, thiamin, riboflavin, B6, calcium, iron, potassium and manganese. Cut the eggplants lengthwise into 1/2-inch-thick slices. Sprinkle slices on both sides with salt and let drain in a colander to release excess moisture. Rinse the eggplant slices and pat dry with paper towels. In a bowl, stir together mozzarella, goat cheese, 1-tablespoon chives, and salt and pepper to taste. Brush both sides of eggplant slices lightly with oil. Lightly coat a clean grill with cooking spray and heat to medium (or preheat broiler to high). Grill or broil eggplant 3 to 4 minutes, or until golden and seared. Season with salt and pepper, turn over, brush with more oil, and grill or broil 3 to 4 minutes more, or until eggplant just begins to soften. Remove and let sit 10 minutes. Transfer eggplant to a baking sheet. Arrange basil leaves in slightly overlapping pattern across each slice of eggplant. Place a heaping tablespoon of cheese mixture at the narrow end of each slice, roll up cigar fashion, and secure each with a toothpick. Repeat with remaining eggplant. Arrange rolls, seam sides down, in a lightly oiled 9-by-13-by-2 inch glass baking dish and broil 4 to 6 inches below high heat, 3 to 5 minutes, or until cheese is just melted and bubbling. Puree 1/2 cup chopped basil, remaining tablespoon chives, and 1-cup oil in a blender until smooth. Season with salt to taste to taste. Transfer cooked eggplant to serving plates and scatter tomatoes around rolls and drizzle with basil oil. Quarter cabbage, slice into 1/4-inch strips, and let sit for 5 minutes to bring out the health benefits. Chop or press garlic and let sit for at least 5 minutes. Sprinkle cabbage with 1 TBS lemon juice before cooking to prevent it from turning blue. Heat 5 TBS broth over medium heat in a stainless steel skillet. When broth begins to steam, add cabbage and cover. Saute for no more than 5 minutes. Transfer to a bowl. Toss cabbage with the dressing ingredients while it is still hot. Combine the squash, onion, cornmeal, flour and egg in a large bowl. Stir in enough milk to make a stiff batter. Drop by teaspoonfuls into hot oil. Cook until golden brown. Yield: 4 to 6 servings. Swiss chard is a nutrient dense green leafy vegetable that is rich in omega-3 fatty acids, vitamins A, C, & K, iron, calcium, and magnesium. It is important for bone health to help prevent breakage, fractures, and osteoporosis. 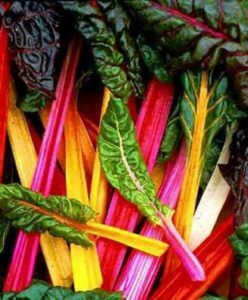 Swiss chard helps regulate blood sugar levels in the body making it great for those with diabetes or blood sugar issues. It is particularly beneficial for anemia, cardiovascular disease, Alzheimer’s disease, constipation, and breast, prostate, ovarian, bone, liver, stomach, pancreatic, and colon cancers. Swiss chard has powerful anti-inflammatory properties making it an ideal food for those who suffer with autoimmune disorders such as cardiomyopathy, fibromyalgia, lupus, chronic fatigue syndrome, arthritis, lyme disease, and type 2 diabetes. It contains a large number of phytonutrient antioxidants such as betalains shown to help protect the body from chronic illnesses such as heart disease, multiple sclerosis, and COPD. The nutritional benefits of Swiss chard are most readily available when eaten raw or juiced. Swiss chard is wonderful in salads, smoothies, sandwiches, wraps, and nori rolls and freshly made juices. It is a relatively easy vegetable to grow. Spinach – Three cups of spinach contain about 18 mg of iron. Meet your daily RDA of iron with one hearty spinach salad. Broccoli is jam-packed with iron and key nutrients like vitamin K and magnesium and is high in vitamin C, which helps encourage iron absorption in the body. Lentils one cup of lentils has more iron than an 8-ounce steak and are a solid source for dietary fiber, potassium, and protein. Kale- Three cups of kale contain 3.6 mg of iron. Bok Choy will feed you a healthy dose of vitamin A and 1.8 mg of iron per cup. Baked Potato – One large baked potato contains nearly three times the amount of iron as a 3-ounce serving of chicken. Sesame Seeds – One tablespoon of sesame seeds contains 1.3 mg of iron. Cashews have the added benefit of being very rich in iron. A ¼-cup serving contains about 2 grams of iron. Soybeans – A single cup of cooked soybeans contains between 8 and 9 mg of iron. 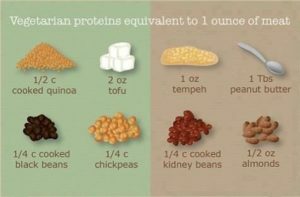 They’re also one of the 20 highest protein vegetarian foods. Chickpeas – One cup of chickpeas contains 4.7 mg of iron. Dark Chocolate promotes healthier skin and teeth, reduces anxiety, and contains 2 to 3 mg of iron. Swiss Chard – One cup of Swiss chard has 4 mg of iron and valuable nutrients, including omega-3 fatty acids, vitamins A, C, and K, and B folates. Tofu boasts 3 mg of iron per half cup. Kidney beans contain 3-4 mg of iron per cup. Place ingredients in a blender adding enough milk to get the desired consistency. You may need to adjust measurements depending on size of potato. Preheat Oven 450 Degrees. Take half of the sweet potato and cut it into large slices about 3/4 inch thick and then cut the larger slices into fries. Place potato slices in a bowl and coat lightly with oil. Mix in the chili powder, cumin, black pepper, salt and cayenne pepper. Space the fries on a baking sheet. Make sure they’re not touching. They’ll get soggy otherwise! Put them in the oven for 15 minutes. Take them out and flip them and put them back in the oven for 10 minutes. 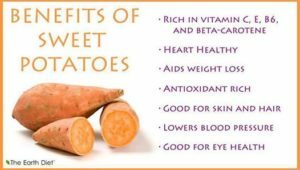 The Center for Science in the Public Interest (CSPI) ranks the sweet potato as one of the best foods to eat. It would take 23 cups of broccoli to provide the same amount of vitamin A as one medium sweet potato! 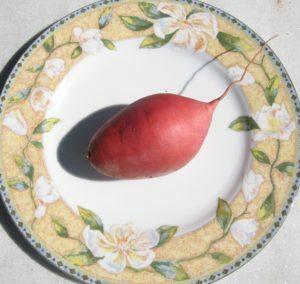 Sweet potatoes are more nutritious when cooked with the skin. Preheat your oven to 350F. Mix cream, garlic and chili in a large bowl. Season. Finely slice sweet potato into rounds. Toss sweet potato slices in the cream mixture. Layer half the sweet potato in an ovenproof dish. Scatter over the peanut butter and finish with the remaining sweet potato. Cover with foil and bake for 30 minutes. Remove the foil and bake for another 20-30 minutes until the sweet potato is tender and browned on top. 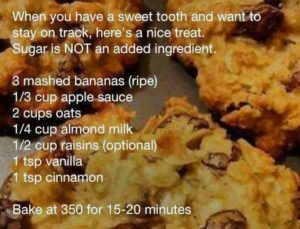 You can replace cream with coconut milk and replace the peanut butter with a few handfuls of chopped bacon or pancetta. You might also combine the peanut butter with a few tablespoons Thai red curry paste if you like and serve with lime wedges. Peel sweet potatoes and cut into eighths lengthwise. Toss with olive oil until lightly coated and salt and pepper to taste. Evenly distribute sweet potatoes on rimmed baking sheet. Bake for 30-35 minutes or until lightly browned. Combine yogurt, lemon juice, curry, and honey in small bowl. Mix until evenly combined. Add salt and pepper to taste. Combine all dry ingredients in a large bowl. Mix together remaining ingredients and stir into dry mixture, stirring just enough to avoid lumps. Pour into an oiled and floured 9- by 9-inch pan. Bake for 45 minutes at 350 degrees F, or until a toothpick inserted in the center comes out clean. Heat the oven to 400˚F with the rack in center position. Prick the potatoes several times with a fork and wrap each in foil. Roast the potatoes until very tender, about 45 minutes. Remove the foil and halve the potatoes. Scoop the flesh into a bowl. Mash the potatoes with the butter, zest, juices, garlic, allspice, and sea salt to taste. Toss together the bread crumbs, pecans, scallions, and Parmesan in a bowl. Reduce the heat to 375˚F and grease a 1-quart shallow glass pie plate or ceramic baking dish. Spoon the potatoes into the dish and top with the crumb mixture. Bake until the crumbs are golden and the potato mixture is hot, about 30 minutes. Put all liquid ingredients together in one bowl. Mix up the dry ingredients in a different bowl. Slowly add the liquids to the solids and stir until mixed together well. Pour into an 8×8 glass or corning wear dish. Bake in oven on 325 about 25 minutes until it sets. Serve warm or cold as a dessert, breakfast or side item. Preheat oven to 400 degrees F. Mash sweet potatoes with a fork. Finely chop the cranberries. With a spoon, combine the cooked quinoa, brown rice, spinach, green onions, cranberries, sage, and salt, with the sweet potatoes. Prepare a large cookie sheet with parchment paper or a silicone sheet. Using an ice cream scoop with a lever, place a large scoop of the sweet potato dough onto the prepared cookie sheet. Gently push the dough out into a “patty” shape. Bake for 45-60 minutes. For crispy patties, use convection, and a drizzle of olive oil. Be wary when flipping patties or removing from the cookie sheet too soon. Alternatively, bake for an hour, and then pan fry with a little olive oil. Combine the sweet potatoes, sugar, eggs, butter, milk, nutmeg, baking powder and salt in a large mixing bowl. Beat until well combined. Pour into the pie shell. Bake at 400 degrees for 30 minutes until the filling is set. Serve hot or cold with whipped cream. Preheat the oven to 350°F. Coat a 9″ springform pan with cooking spray. Combine the potatoes in a large saucepan over high heat with enough cold water to cover by 2″. Bring to a boil; cook until the potatoes are tender, 12 to 15 minutes. Drain and mash; cool. Bring 1 cup water to a boil in a small saucepan over high heat. Remove from the heat, add the apricots and let stand for 10 minutes; drain. In the bowl of a food processor, combine the cookies and cereal and process until finely ground. Transfer to a bowl and add the butter; mix well. Firmly press the mixture into the bottom and 1″ up the sides of the prepared pan. Bake for 10 minutes; cool on a wire rack. Reduce the oven temperature to 325°F. In the bowl of an electric mixer, place the mashed sweet potatoes, cream cheese, and Neufchatel cheese and beat on high speed until smooth, about 1 to 2 minutes. Add the yogurt, egg whites, sugar, ginger, flour, pumpkin pie spice, vanilla extract, and salt and beat well. Sprinkle the apricots over the bottom of the prepared crust. Pour the potato mixture over the apricots. Bake until the cheesecake is almost set, about 42 to 45 minutes. Turn the oven off and let stand for 1 hour. Remove from the oven and allow cooling to room temperature. Cover with plastic wrap and chill for at least 3 hours before serving. Preheat oven to 400°F. Slice the potatoes in half lengthwise and then cut each half into four wedges. Toss the wedges with the oil, cayenne pepper, paprika, and salt, and lay the pieces on a baking sheet. Bake for 35 to 45 minutes, until they’re browned on the outside and tender all the way through. In a large skillet, heat 1 teaspoon oil over medium-high heat. Add apple and onion and cook until soft. Set aside in a covered bowl. Add 1 tablespoon oil to skillet. Spread potatoes in pan in an even layer and press them down lightly with a spatula. Cook until golden brown on the bottom (about 5 minutes). 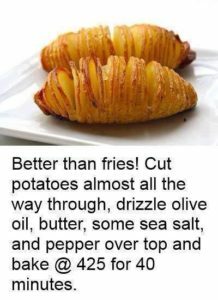 Drizzle with remaining oil and flip potatoes. Cook for about 5 more minutes. Add apple and onion mixture to potatoes and heat through. Sprinkle with cinnamon and add salt and pepper to taste. 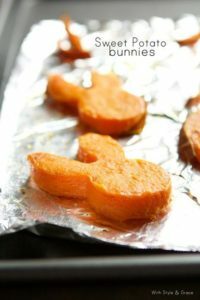 Bake the sweet potatoes in a 425°F oven until soft, about 70 minutes. Remove sweet potatoes from oven and allow them to cool slightly. In a small bowl, whisk together orange juice, orange zest, brown sugar, 1/4 teaspoon salt, cinnamon, and chili powder. Scoop out the insides of sweet potatoes and place in a large mixing bowl. Pour orange juice mixture over sweet potatoes, mash well, and serve. Preheat the oven to 450°F. Melt the butter with the olive oil in a small saucepan over medium heat. Stir in the rosemary. Cut the sweet potatoes lengthwise into 1 1/2-inch-thick wedges and place in a large bowl. Season with salt and pepper, and drizzle with the butter mixture. Toss gently. Arrange the wedges on a large baking sheet in one flat layer so they don’t touch. Bake in the upper part of the oven, turning once, until softened and lightly browned, about 20 minutes. Season again with salt and pepper, and carefully remove from the sheet (wedges are relatively fragile after cooking). Heat oil in large saucepan. Add onion and cook until soft. Add stock plus 2 cups water. Add sweet potato, carrot, and ginger. Bring to a boil, reduce heat, and simmer until vegetables are tender, about 15 minutes. Strain out vegetables and put them in a food processor or blender. Puree until smooth, adding a bit of broth if needed. (If using a blender, allow mixture to cool first. Depending on the size of your blender, you may have to do this in batches. Pour vegetable puree back into the saucepan and stir until well blended and smooth. Add salt and pepper to taste. Serve with a dollop of yogurt on top. Whisk together the mashed potatoes, 1 1/2 cups of the broth, ginger, allspice, and nutmeg in a medium saucepan and bring to a simmer over high heat. Reduce the heat to low and cook, stirring occasionally, for 10 minutes. Whisk in the 1/4 cup creme fraiche and more broth, if needed, and cook for 5 minutes. Whisk together the remaining 1/4 cup of creme fraiche and chipotle puree in a small bowl, and season with salt and pepper. Ladle the soup into bowls and top with a dollop of the creme fraiche, cilantro leaves and tortilla chips. Preheat oven to 350 degrees F. Lightly spray 12 (6-ounce) ramekins with cooking spray. Divide the ramekins among 2 baking sheets and set aside. Empty sweet potatoes into a large mixing bowl, add butter and beat with a hand mixer until smooth. Mix the remaining ingredients (except marshmallow topping) and beat until smooth. Pour into prepared ramekins and bake in preheated oven for 30 minutes. Remove from the oven and top each soufflé with a dollop of marshmallow topping. Place under the broiler until lightly browned. Put potatoes in a medium pot and cover with water. Bring water to a boil over medium heat and cook until tender. Drain the potatoes and let to cool. When the potatoes are cool enough to handle, peel off the skin. Cut the potatoes into large chunks and add to a mixing bowl. Mash with a potato masher or fork. Add the sugars and mix thoroughly. Stir in the lemon zest, ground almonds, cinnamon, anise extract and honey. Roll out 1 of the pastry sheets on a floured cutting board. Using a 3 to 3 1/2-inch biscuit cutter, cut out as many circles of the dough as possible. Put a dollop of sweet potato filling on each circle and fold the circles in half to form a half moon. Press the edges together with a fork to seal and arrange on sheet tray lined with parchment. Brush the top of each turnover with beaten egg. Bake until golden brown, approximately 15 minutes. Remove and cool for 5 minutes. Arrange on a serving platter, dust with powdered sugar and serve. Preheat oven to 350 degree F. Bake sweet potatoes for 1 hour in the oven on a baking sheet. When done, let cool. Scrape the pulp out of the skin, transfer to a large bowl, and mash. Set aside. In a medium bowl, beat together butter, sugar, and brown sugar until creamy. Add eggs, vanilla, cinnamon, ginger, nutmeg, allspice and salt. Add evaporated milk and stir mixture into sweet potatoes. Beat together with mixer until smooth and pour into an unbaked pie shell. Bake on bottom rack of oven for 1 hour or until center of pie is firm. Serve warm. Add dollop of maple whipped topping. In a medium bowl, beat together whipping cream and confectioners’ sugar. Add maple syrup. Beat together until soft peaks form. Slice onions and chop garlic and let sit for 5 minutes to enhance their health-promoting properties. Cut yams into 1″ cubes. Heat 1 TBS broth in a 12-inch or larger stainless steel skillet. Sauté onions over medium heat stirring frequently. Add garlic and ginger and continue to sauté. Add yams, cinnamon, honey, and 1 cup of broth. Mix and simmer over low heat covered for about 15 minutes, or until yams are tender. Season with salt and pepper. Add everything to your blender or food processor and pulse together. You can add seasonings as you see fit to your taste. For a thicker salsa consistency blend less. 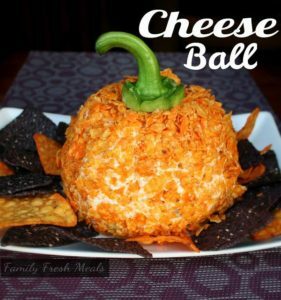 Pour in a bowl and enjoy with chips. Dice the seasonings fairly fine, about 1/8 inch cubes. Add the seasonings and bring to a gentle simmer, just to get it hot (180 F, if you have a thermometer) there’s no need to cook it; only to get it hot enough to ready it for water bath processing to kill any bacteria and enzymes. Reduce heat and simmer for 30 minutes, stirring occasionally. Mash the garlic and salt together into a paste. Whisk the paste into the egg yolk in a bowl until well blended. While whisking, slowly drizzle in about 1 teaspoon of grapeseed oil at a time until the mixture becomes thick and add the olive oil to the mixture in a slow steady stream. Stir in the curry powder and season with lemon juice, pepper, and salt to taste. Refrigerate in a lidded jar to store. Dip, spread, and enjoy! Mix together all the ingredients except for the eggs. Cover the mixing bowl and let the mixture sit at room temperature for 4-6 hours. Pour mixture into a double boiler and gently bring the water in the bottom pot to a simmer. Carefully add the eggs to the mixture, stirring them in gently. Keep the water at a simmer until the mixture has thickened. Pour mixture into a glass jar, secure a lid and refrigerate. Mustard will be ready to eat once it has chilled completely. 4 cups finely chopped green cabbage. 1- 12 oz. pack of uncured bacon cooked to crisp. and chopped. 1 T fresh parsley finely minced. In a large skillet, cook bacon strips until crispy and set aside. Chop all of the ingredients into bite-sized pieces and combine in a bowl. Mix in the parsley, garlic powder, and salt and pepper and enjoy! Put the egg, seasonings and ¼ cup oil in the blender and whirl until well mixed (20 to 30 seconds). Pour in the rest of the oil in a steady stream. Stop as soon as the emulsion is smoothly blended. Place the greens and the herb with the egg, egg yolk, and pepper in an electric blender or food processor and blend until the greens are pureed. Start adding the oil in a slow, thin stream until the mixture becomes too thick, then add the lemon juice and continue until all the oil is used up. If too thick, add a small amount of boiling water. 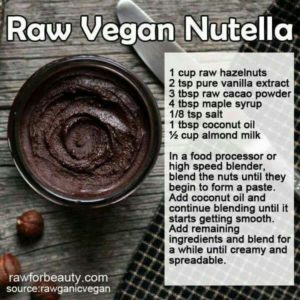 Taste and refrigerate in a covered bowl or jar. This must be used within a few days; after that the greens tend to turn sour. If you plan to keep it longer, blanch the greens for a minute in boiling water, then squeeze dry before using. Pulse herbs in a blender with lemon juice and ½ cup mayonnaise until puréed. Add remaining ½ cup mayonnaise, salt, and pepper and blend well. Transfer to a bowl and chill, covered, at least 2 hours to allow flavors to blend. Place ingredients, except mayonnaise, in a blender jar and process until smooth. Stir into mayonnaise and whisk until smooth. Makes 2 1/2 cups. Put chives, tarragon, parsley, vinegar, egg and garlic into a blender or food processor. Add the mustard and one tablespoon olive oil. Process for 10 seconds, then add the oils in a thin stream very slowly while you process. Keep adding oil until the mayonnaise is thick. In a small bowl, combine all ingredients until well blended. Cover and chill until ready to serve. Serve with assorted fresh fruits (strawberries, pineapple, kiwi, grapes and apple) or assorted dried fruits (apricots, apples, pears) or with chunks of angel food cake. In a food processor, combine all ingredients and process until smooth and creamy. If too thick, add 1 tbl water until desired consistency. Serve immediately with hot pita bread, veggies, or pita chips. Store in an airtight container. Sun dried tomato hummus can be made up to two days in advance. Drain chickpeas and set aside liquid from can. Combine remaining ingredients in blender or food processor. Add 1/4 cup of liquid from chickpeas. Blend for 3-5 minutes on low until thoroughly mixed and smooth. Place in serving bowl, and create a shallow well in the center of the hummus. Add a small amount (1-2 tablespoons) of olive oil in the well. Serve immediately with fresh, warm or toasted pita bread, or cover and refrigerate. Wash spinach, wilt in a saucepan. drain any liquid and chop. I place everything in a blender or processor and mix till flecks of green and white. 1 lb. washed spinach tough stems removed. Cook spinach about 5-7 minutes, drain well and chop. Place all ingredients in a food processor and pulse4-5 times till mixture contains flecks of green and white. Put in container and chill covered 4-5 hours. Serve with small shapes of bread, crackers or chips. In a bowl, combine all the ingredients and stir to mix well until the sweetener is dissolved. The longer the sauce sits, the more heat it takes on from the ginger and red pepper flakes. Mix all ingredients in a jar. Shake the jar to mix the ingredients well before each use. Mix all ingredients in a jar. Shake to mix ingredients well before each use. Store in a dry, cool place. Mix ingredients in a jar, then shake the jar to mix the ingredients well before each use. Store in a dry, cool place. Nightshade free? 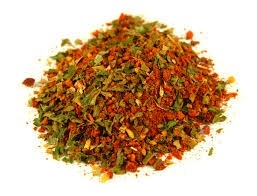 Do not use recipes with paprika, chili powder, chipotle powder or red pepper flakes. Combine spices in a bowl and store in a small container. Bring milk, half and half, and heavy whipping cream to a boil. Add crab, fresh parsley, Old Bay Seasoning, butter, salt and pepper. When it starts to boil, make a paste of cornstarch and water to thicken soup. Garlic Soup – People are turning back to nature to find remedies for health problems. This soup, made from 50 garlic cloves, 1 red onion, and thyme, is capable of fighting off many flu viruses, colds, and the Norovirus. 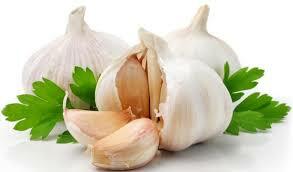 The new and mutated viruses, not affected by traditional antibiotics, are still affected by garlic. Garlic’s antibiotic properties are due to the chemical allicin. A study by Washington University showed that garlic is 100 times more effective than the 2 most popular antibiotics on the market. Preheat the oven to 350°F (180°C). Chop off heads of bulbs, spread out on foil, drizzle with olive oil, and wrap them. Place in a pan in the oven to cook about 90 minutes and cool. Mix 2 tablespoons of olive oil and 2 tablespoons of butter in a soup pot, over medium heat. Place diced red onion in the mixture, and cook for 10 minutes, stirring frequently. Grind the garlic and mix it together well with the stewed red onion. Add the fresh thyme and any other herbs. Lower the temperature and mix in the bread crumbs/cubes. Cook about 5 minutes until the bread softens. Remove the fresh herbs from the mixture and place in a blender until it becomes a semi-creamy mixture. Place it back into the pot, add in the sour cream, and salt or pepper according to your taste. Enjoy! Heat oven to 400°F. Arrange tomatoes, eggplant, onion and garlic on a baking sheet. Brush vegetables with oil. Roast them for 20 minutes and then remove the garlic cloves. Return pan to the oven for another 25 minutes until vegetables are tender and brown in spots. When done, scoop eggplant out from skin into a large saucepan. Add the rest of the vegetables, thyme and stock and bring to a boil, then reduce to a simmer. Cook until onion is tender, about 45 minutes and cool slightly. Puree soup in blender until smooth. Return to pan and add the cream. Bring the soup back to a simmer and season with salt and pepper. Sprinkled goat cheese on top when serving. Heat a medium saucepan over medium-high heat. Add the oil and swirl to coat the pan. Add the lemongrass, stir, and sweat it, uncovered, for 2 minutes. Add the onions and chiles, if using, and sauté, stirring, for 1 minute. Add the chicken and sauté until opaque, about 1 minute. Add the fish sauce and broth, stir, bring to a simmer, and cook until the liquid is reduced slightly to intensify its flavor, 15 to 20 minutes. Whisk in the coconut milk and lemon juice. Season with salt and pepper, garnish with the scallions, and serve. Preheat oven to 375°F. Oil baking sheet. Bake squash about 50 minutes. Remove peel from squash. Cut squash into pieces and put in large pot and mash with a potato masher then add some of the chicken broth slowly and simmer. Heat oil in pan and add the onion, chopped pepper, brown sugar, ginger, garlic and cinnamon. Cover pot and cook until tender, about 15 minutes and stir into the squash mixture. Bring to boil. Reduce heat to medium-low. Cover and simmer 10 minutes. Discard cinnamon. Garnish with chopped parsley. In a large soup pot over medium heat, melt the butter. Add the shallots, celery and garlic. Sauté for a few minutes. Add stock and cream, then nutmeg, paprika and cayenne. Add sweet potato and simmer. Reduce heat to low and stir in the crabmeat. Cook until heated through. Stir in lemon juice. Blend to puree for a few seconds to desired consistency. Ladle into warmed shallow bowls and garnish with parsley. It’s a tasty, nutritious, and wild edible! 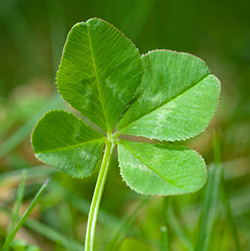 The leaves and blossoms of clover are high in calcium, chromium, magnesium, niacin, phosphorus, potassium, thiamine, and vitamin C. Considered a dark green vegetable, clover has the same healthy nutritional qualities that spinach has. Clean and dip clover flowers and leaves in cold salted water. Remove and cut into pieces. In a large saucepan, sauté flowers, leaves and onions in butter. When all is softened add water, then potatoes, and season with salt and pepper. Cook gently for 20 minutes. Drain the cooking liquid and save it. Puree potato mixture and dilute with the cooking liquid, stirring constantly. Bring to a boil, the reduce heat and simmer for 3 minutes. Can sprinkle with grated cheddar cheese if desired. Spicebush berries, dried (Appalachian Allspice), grated over soup to taste. Sauté the clover blossoms and leaves along with chopped onions in the sunflower seed butter. Add the water, groundnuts, and seasonings. Simmer, covered, for 20 minutes. Serve hot. Here is a good bone broth recipe – it is amazing how much you get out of a big pot of broth. You can freeze some of it – but it keeps in the fridge for a couple weeks. Once you’ve made it, you can put some broth in a pot and make some meatballs out of beef or turkey, and put those in and cook for like 30 minutes. Then add cut carrots, cauliflower, onions, and other vegetables (I also like to use green beans), and simmer for a bit longer and you have a delicious soup with little effort. There are endless variations on this — it’s good to add fresh garlic at the end, but remember to let it sit out for ten minutes after you crush it. Then chop and add to the soup. It’s really good! You can obviously put in whatever herbs and spices you want too. Depending on the size of stock pot — for 16 quart use 4 lbs bones, for 8–12 qut use 2–3 lbs of bones. The bones can have some meat on them too. Try to use grass fed meat bones, soup bones, knuckles, etc., or whole chicken or chicken pieces, or other animal bones not from confined feeding lots. 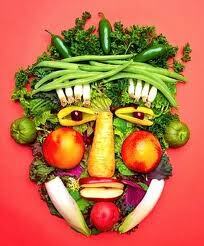 vegetable scraps such as the ends of onions and carrots, core of the cabbage, leaves from celery, onion peels, etc. Place bones in the stockpot. Add 1/4 cup apple cider vinegar (this helps leach the minerals from the bones). Fill pot 3/4 full with filtered water and any optional herbs, pepper, and vegetables. Cook on medium high until bubbling. Then reduce heat to low and simmer, covered, at least 8 hours for chicken, and 24–48 hours for beef bones. When done, cool and pour stock through a strainer and transfer to storage containers. Refrigerate. Stock should be good for up to 2–3 weeks, so make larger batches to save time. The fat will rise to the top of the jars in the fridge, which can be included in soups or used as fat for cooking. Pick all cooked meat pieces from the strained stock and save for adding back into soups. Do not discard any marrow or gelatinous parts. You can use an immersion or regular blender to blend it into your stocks and soups. These parts are filled with healing nutrients and were a large part of our ancestors’ diets. Put all ingredients in slow cooker overnight or longer and set to low (8-24 hours). In the morning, strain broth and freeze in separate glass containers. Bone broths provide important minerals and vitamins that we need to cope with stress in our daily lives. 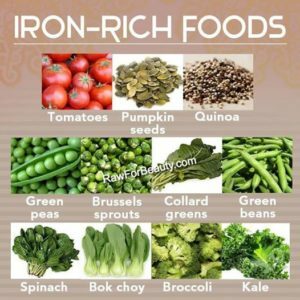 It is an inexpensive way to get minerals and vitamins without taking supplements, which sometimes are not absorbed by the body when isolated from foods in supplements. Broth fights wrinkles, cellulite and is good for loose skin after weight loss. It’s like botox in a bowl! You can put veggies or herbs but sometimes they turn bitter when cooked for a long time. I would use the broth made here to make other soups later where you use veggies, grass fed meats and herbs. This slow cooking recipe is aimed at getting the most minerals out of the bones to heal gut inflammation. Simmer the above ingredients covered for 2 hours. Strain & save. Drink to keep you breathing. It’s great for congestion. Add veggies or herbs but sometimes they turn bitter cooking for a long time. If you decide to add vegetables and herbs add them late in the cooking. This slow cooking recipe is aimed at getting the most minerals out of the bones. The broth buffers stress and heals gut inflammation. Chop the one onion for the broth. Thinly slice the two onions and garlic, which will later be added to the broth and let them all sit for 5 minutes to bring out their health-promoting properties. To prepare broth, heat 1 TBS broth in medium soup pot. Sauté chopped onion over medium heat for 5 minutes, stirring frequently, until translucent. Add the rest of the broth and remaining broth ingredients and stir. Bring to a boil, reduce heat to medium low, and simmer broth ingredients briskly together for 20 minutes, uncovered. This will bring out a lot of flavor from the ingredients. In a separate medium sized stainless steel skillet, heat 1 TBS of soup broth over medium heat. Healthy Sauté sliced onions over medium low heat in broth, stirring often for about 5 minutes, until translucent. Add garlic and sauté for another minute. After cooking broth for 20 minutes strain while it is still hot and return liquid to pan. Slice mushrooms (and discard rest of strained ingredients) and return to broth. Add sautéed onions and garlic and season with salt and white pepper to taste. In a large saucepan, sauté onion and garlic in olive oil for 2 to 3 minutes until onion is transparent. Add flour, stirring constantly for 1 minute over medium heat. Pour in stock and heat until boiling, stirring well. Add tomatoes, salt, pepper, sugar and basil leaves. Allow soup to come back to a boil, then reduce heat and simmer for 30 to 40 minutes. Place soup in a blender or food processor and puree until broth is smooth and return to saucepan. Add milk and heat soup – do not boil. Garnish with Sour Cream, basil leaves or flowers. Place a large stockpot over medium heat. Sprinkle the bottom with a pinch of salt and heat for 1 minute. Add the oil and heat for 30 seconds, being careful not to let it smoke. Add the onions, carrots, celery, bell pepper, and chipotle pepper. Sauté for 10 minutes, stirring often. Add the stock, potatoes, and thyme, bring to a boil, reduce the heat, and simmer until the potatoes are tender, 15 to 20 minutes. With the back of a spoon, smash some of the potatoes against the side of the pot and stir to thicken the soup. Add the raw corn and Cashew Cream, season with salt and pepper to taste, and simmer for 15 minutes. Remove the chipotle pepper and thyme sprigs. Garnish with the chives, tomato, and roasted corn kernels. In a large saucepan, sauté onion and garlic in olive oil for 2 to 3 minutes until onion is transparent. Add flour, stirring constantly for 1 minute over medium heat. Pour in stock and heat until boiling, stirring well. Add tomatoes, salt, pepper, sugar and basil leaves. Allow soup to come back to a boil, then reduce heat and simmer for 30 to 40 minutes. Take soup and place in a blender or food processor. Puree until broth is smooth and return to saucepan. 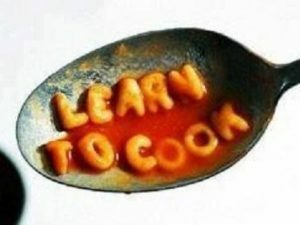 Add milk and heat soup – do not boil. Serve with a dollop of sour cream and a basil leaf or flower in the center. In a large pot heat 3 tablespoons oil and sauté the following: 1 chopped onion, 3 chopped garlic cloves and the zest of 1 orange. Cook for about 10 min until onions start to brown. Stir in 3 large, chopped and cored fennel bulbs and cook for about 15 min. Season with salt and pepper. (Optional – add 2-3 ounces cognac, brandy or orange liquor and stir.) When alcohol is burned off add 2 cups chicken stock. Simmer over low heat for 15 minutes. Add cooked squash, mix thoroughly, and season with salt and pepper. Puree in blender at high speed. Add just enough extra chicken broth (1-2 cups) to ensure the soup turns smoothly in the blender. Season to taste. Slowly cook bacon in large, heavy soup pot, until crispy. Add the onion and garlic and cook over medium heat until softened. Add the washed collards and season with salt and pepper. When the collards begin to wilt in the bacon fat, add white wine and bourbon and bring the soup to a simmer. Add the stock, red pepper flakes and bay leaves. Return soup to a simmer about 40 minutes. Add the black-eyed peas, thyme and Worcestershire. Directions: Add all ingredients, except coconut beverage, to a large pot. Bring to a boil, then simmer for 10 minutes or until everything is very soft. In a blender, process the soup with coconut beverage until smooth. Top with pesto if desired. If you want relief from flu, cold, ear infection and many other problems. Using garlic, red onion and thyme in the soup will destroy the virus and the weak immunity. Heat oven to 180 degrees. Cut up 1/3 of the garlic. Wrap the garlic with olive oil in aluminum foil. Bake in the oven for 90 minutes and let it cool. Heat some olive oil and butter in a pot and stew the onions for 10 min. Squeeze the garlic and add to the stewed onions. Mix all and add the thyme, chicken soup and herbs. Reduce the temperature; add bread and leave to simmer 5 min until bread is soft. Remove the herbs and put the mixture in the blender until creamy. Return to the pot and add the sour cream and salt. Soup’s on! Remove seeds from the pumpkin’s cavity and wipe them with a paper towel to remove excess pulp. Spread evenly on a paper bag and let dry overnight. Place in a single layer on a cookie sheet and roast in a 160-170°F oven for 15-20 minutes. Roasting them a short time at low temperature helps preserve the healthy oils. French Cheese Cake Wheel! Perfect for a celebration! Place the wheel of Brie on a wooden board. Sit the Saint Nectaire cheese on top of the brie, followed by the Tomme, Bresse Bleu and the small Crottin goat’s cheese on top. Push fennel flowers and buds around the base of the Saint Nectaire cheese, making sure they are pushed in. 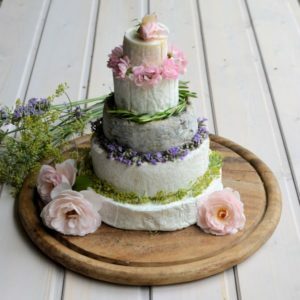 Do the same with the lavender flowers between the Tomme cheese and the Saint Nectaire cheese; arrange rosemary leaves around the base of the Bresse Bleu next. Push the tiny pink roses and rose buds around the base of the Crottin goat’s cheese. Place the large pink rose on top. You may use any seasonal flowers and herbs and match the colors to any wedding bouquets or celebratory table settings. Spicy Pecans They’re sweet, salty and totally addictive! Preheat oven to 400 degrees. Line a baking sheet with parchment paper and coat with cooking spray. In a small bowl, mix brown sugar, granulated sugar, salt, cinnamon, cayenne pepper, nutmeg and cloves. In a separate bowl, whisk egg white just until lightened up and bubbly, not stiff. Add the pecan halves to the egg white and stir until each pecan is completely moistened. Add sugar and spice mixture to the nuts and stir until the pecans are evenly coated. Transfer the pecans to the prepared baking sheet. Separate any nuts that are sticking to each other and spread into an even layer. Bake 30 minutes, stirring the nuts after 20 minutes and every 5 minutes thereafter. Remove nuts from the oven and cool to room temperature. Once the nuts have cooled, separate any nuts that are stuck together. Drain the crabmeat of liquid. Set aside. Mix together the cream cheese and mayonnaise, then add the spices, seasonings and sherry. Fold in the crabmeat and add the Mozzarella and half the Parmigiano Reggiano. 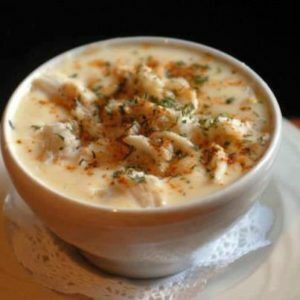 Put the crabmeat mixture in a shallow ovenproof dish. Mix the breadcrumbs and the remaining Parmigiano Reggiano and scatter over the top. Bake in the preheated oven for about 20 minutes until the mixture is bubbling and hot. Serve immediately with crackers, on Crostini, or with slices of soft French bread. A bit of cayenne pepper adds a pop of spice to pecans without making them super hot. They’re sweet, salty and totally addictive! You may be wondering, what’s up with the egg whites? Well, they actually help the sugar and spice stick to the nuts. Egg whites dry in the oven to become light and crispy, giving the pecans a perfectly airy coating. Bake 30 minutes, stirring the nuts after 20 minutes and every 5 minutes thereafter. Remove the nuts from the oven and allow them to cool on the baking sheet to room temperature. (Nuts will become crispy as they cool.) Once the nuts have cooled, separate any nuts that are stuck together. Start munching! Preheat oven to 300°F. Coat a rimmed baking sheet with nonstick spray. Whisk egg white, agave, curry, salt, and cayenne in a medium bowl. Add nuts and seeds and toss to coat. Using a slotted spoon, transfer mixture to baking sheet, letting excess egg drip back into bowl. Bake, tossing once, until mixture is golden brown, 20–25 minutes. Let cool on baking sheet. Store airtight at room temperature. Place desired amount of coconut flakes in a large skillet. Cook over medium heat, stirring frequently, until the flakes are mostly golden brown. If the coconut is sweetened it tends to brown faster so, it will take less time. Preheat oven to 325°F. Spread coconut flakes on a baking sheet in a thin layer and bake in preheated oven. The flakes will toast very quickly and won’t take more than 5-10 minutes. After a few minutes stir the coconut to help ensure even color. Remember, sweetened flakes will take less time because sugar speeds the toasting process. NOTE: If you have unsweetened flakes and would like to sweeten them, place a pound of unsweetened coconut flakes in a zip top bag with some confectioners sugar. Give them a good shake and you have sweetened coconut. Half jalapeños, remove seeds, and set aside. In a small bowl, mix together the goat cheese, green onion, garlic powder, and basil. Stuff each pepper half with the goat cheese mixture (about a teaspoon) and then wrap in bacon. Make sure bacon wraps over peppers to prevent them from splitting. Put the jalapeno halves on a baking sheet in the oven until the bacon is cooked and crispy! About 13-15 minutes. 1/2 cup gluten-free blue cheese. Try Costello Blue Cheese. Preheat oven to 375 degrees F. Prepare a baking sheet with aluminum foil. Slice dates along the side so they open flat for stuffing. 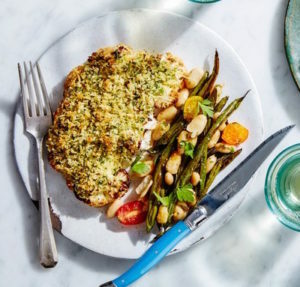 Fill date with a teaspoon of blue cheese. Wrap it with a slice of bacon. Make sure that the blue cheese opening is sealed and bacon overlaps underneath. Seal with a toothpick, and arrange (seam side down) on the baking sheet. Repeat with remaining dates. Bake for 20-25 minutes until bacon is cooked and cheese is browned. Turn each date after 10 minutes. Remove and drain on a paper towel. Serve warm. 2 cups nacho cheese chips, crumbled, top of 1 bell pepper for stem garnish. 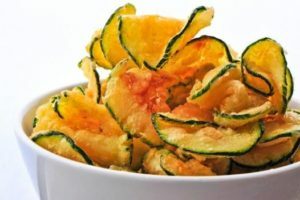 Cut zucchini into thin slices and toss in 1 Tbsp olive oil, sea salt, and pepper. Sprinkle with paprika and bake at 450°F for 25 to 30 minutes. Using paprika to flavor this healthy snack and to boost your metabolism, reduce your appetite, and lower your blood pressure. Drain on a paper towel. Sprinkle with seasoning. Wash, dry and break dandelion greens into large pieces. Discard any thick ribs. Drizzle a bit of Olive oil on the greens and toss with your hands to lightly coat all the leaves. Place in a single layer onto a baking sheet. Bake at 350F for about 8-12 minutes. Keep an eye on them so not to burn. Remove pan from the oven, sprinkle the leaves with seasonings and allow to cool. 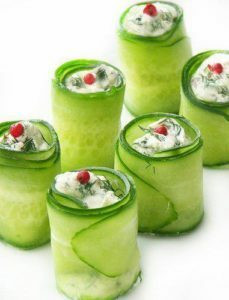 Cut cucumbers thin, lengthwise. Lay each flat and a dab of plain yogurt that has dill and a little lemon mixed in. Wrap cucumber around the mixture and stand up (or let remain lying flat). If you don’t eat dairy, try a very mild mustard that has dill mixed in. Create a breading station – in one bowl, add the flour – in another bowl, add the egg, and in the last bowl – add the breadcrumbs. 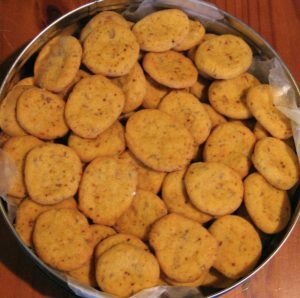 Place a few zucchini sticks in the flour and coat and into the egg mixture, turning to coat and then into the breadcrumbs. Place breaded zucchini onto a baking sheet. Allow them to air dry for about 10 minutes, so breading will adhere to the sticks. To Fry: Heat oil over high heat. Carefully add the sticks, about 4 at a time. Fry the zucchini turning the sticks until browned on all sides. Salt and pepper to taste when taken from hot oil. You may want to add spices of your choice to the flour. Add some parmesan cheese to your bread mixture and bake them for a healthier version. Stir together the cheeses and cream cheese with 1/4 teaspoon each salt and pepper. Make a long cut down the length of the pepper and a short cut crosswise near the top of the pepper in the shape of a T. With the tip of a paring knife, remove the seeds and ribs from the peppers. Fill each pepper with some of the cheese mixture, squeezing the peppers shut. Beat the eggs in a bowl with 1/2 teaspoon salt. Place the flour on a plate. Place the breadcrumbs in another bowl. Heat the oil in a heavy pot to 375°F. Dip a pepper in the egg mixture, then roll in the flour. Dip the pepper in the egg mixture again, then roll in the breadcrumbs. Repeat with the remaining peppers. Fry the peppers in batches until the breadcrumbs are browned and the cheese is melted, about 5 minutes per batch. Drain the poppers on paper towels, then serve hot. Preheat oven to 350 F. Line a baking sheet with parchment paper. Wash and dry leaves and place in a single layer on baking sheet and sprinkle with sea salt. Roast for 8-10 minutes until slightly brown and crispy. Drizzle with lemon juice and serve. Preheat oven to 350. Wash kale and pull off the stem into bite sized pieces. Get it clean and dry. Spread out the kale evenly in an oven pan. Sprinkle with a little lemon juice and add 2 Tbsp of coconut oil on top. Sprinkle seasoning of choice over the kale. Put it in the oven for 10 minutes. Take out and toss with tongs to make sure all the kale is covered with oil. Put back in the oven about 10 minutes. In a saucepan, heat sugar, orange zest, orange juice, and ginger with ¼ cup water until the mixture reduces and turns syrupy. Chop the cilantro and Serrano peppers. Combine chilis and cranberries in a food processor until finely chopped. Transfer into a bowl, and add the ginger-orange syrup. Stir in cilantro, salt, and limejuice. Add a little more sugar and lime as needed; salsa gets better after a couple of hours of soaking in its own juices. Serve with tortilla chips as an appetizer, or serve as a side dish. That’s it! Mix butter and cheese – add cayenne now to distribute evenly. Slowly add flour. I make long rolls about penny size and put them in the freezer. After they have gotten a little firmer I slice the rolls and bake pennies on cookie sheet at 350 degrees about 12-15 minutes. This year I added chopped pecans and a little less flour and they are great! Using a hand mixer, whip the egg whites until they’re thick, white, and foamy (not looking for peaks to form). Add basil, sundried tomatoes, cheese, almond flour and garlic salt. Stir to form a very thick batter. Drop spoonfuls into a greased mini-muffin tin. Bake at 350 for 15 min. Pick new dandelion blossoms (ones on short stems). Rinse in cool, lightly salted water. 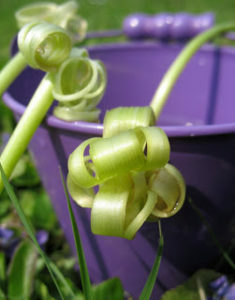 Cut off stem ends close to flower heads, leaving just enough to hold petals together. Roll flowers in paper towels to remove excess moisture. Make batter by combining egg, milk, flour, salt and pepper. Dip flowers into batter. Drop batter-coated blossoms into deep fryer set at 375 F. Fry until lightly browned. Drain on absorbent paper and sprinkle with more salt as taste dictates.